The first is the Bushcrafter, the second is a drop point well executed. 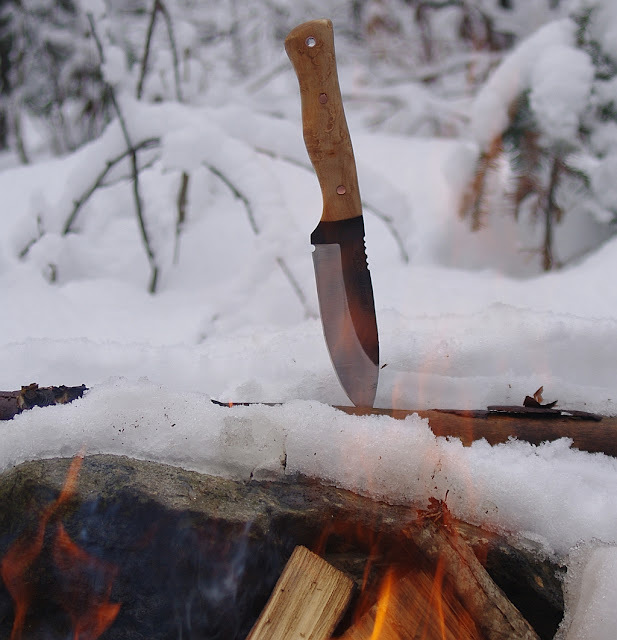 With the knives in hand I couldn't resist getting the Bushcrafter in action. 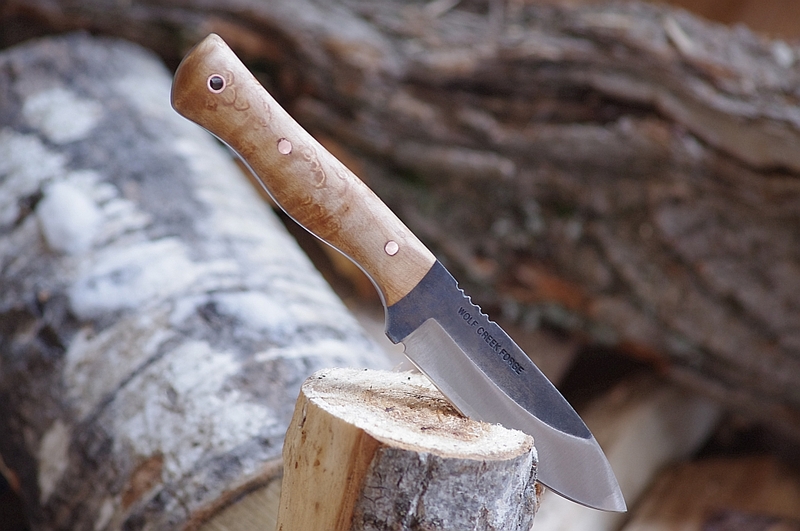 I like both knives and will do a write up on the drop point at a later date, being somewhat pressed for spare time as is I elected to focus on the Bushcrafter. It is made from 5/32" 52100 steel, tempreture controlled heat treat, two tempering cycles. This is my first experience with this steel though I've read a lot of good things about it. Birdseye maple scales are some of my favorite, it is sealed with boiled linseed oil. There are two copper pins and a copper lanyard hole. 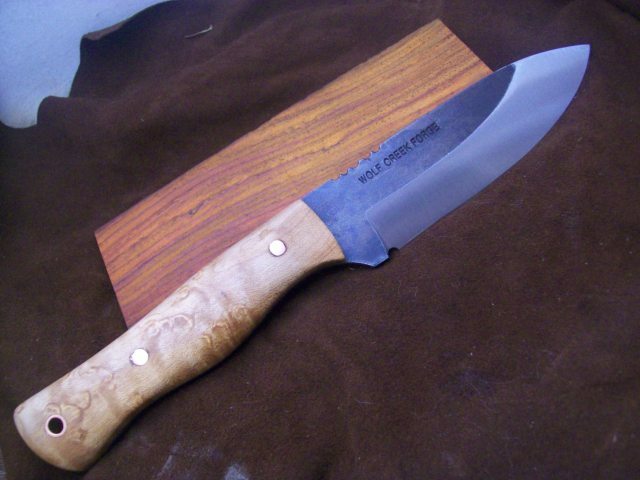 A scandi type grind with a sharp thin convexed edge with some light jimping on spine, 9" overall length with a 4" edge. The edge was very sharp out of the box, enough to shave with, and even sharper after a few licks on a FLEXXX strop it was scary sharp. I've been using one of Flexxx's field strops for several months now and I have to say I've been converted. While I've used strops in the past it was sporadic, after trying the field strop, with green and white compound I'm sold on the product. I love the design, it's a tried and true form that I am very comfortable with. 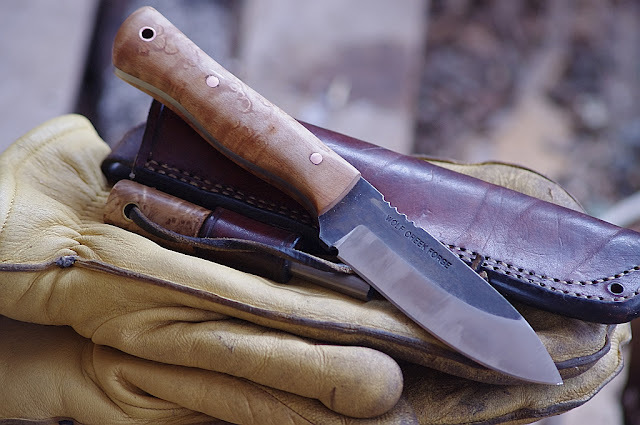 I will likely flatten out the jimping however, as I am not a fan of it and usually remove it from all my knives that had it. The grinds are as close to perfect as I have seen, the fit overall is superb. 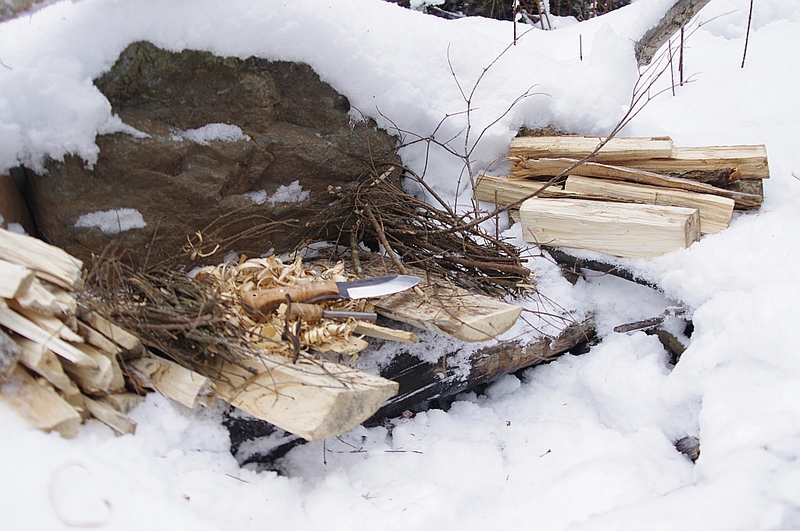 I spent time working the knife through some common fire prep processes, batoning, splitting ever smaller and making a mass of shavings. The knife came with no sheath but that is normal these days and I don't mind at all. I've been buying knives of common sizes and honestly have more sheaths than I need really. 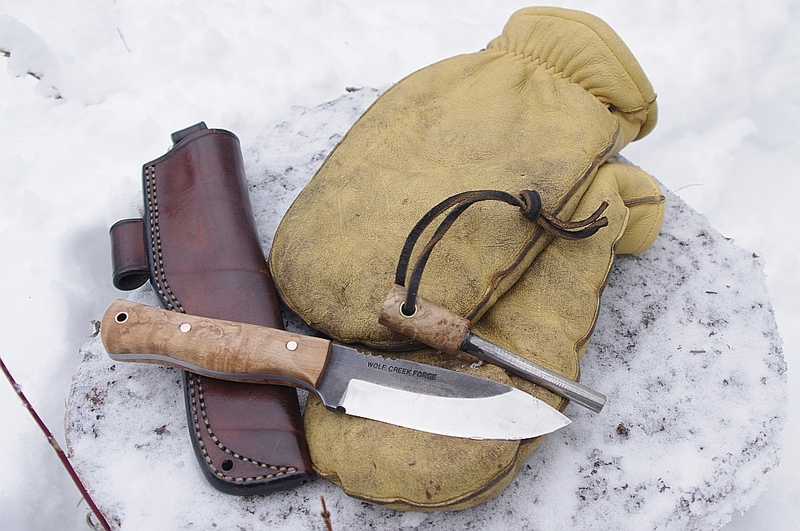 This knife fits perfectly in an Adventure Sworn sheath. Making shavings was a joy, the knife handled well and the thin sharp edge produced some excellently thin curly curls. While the edge is thin and super sharp it's the spine is thick and hefty. I had no concerns when batoning, the only drawback was the short 4" blade as I needed to corner the rounds to make it work. This isn't a bad thing though, as the 4" blade works wonders in pretty much every other capacity. While one can baton with it without worry, it is a little short for it. 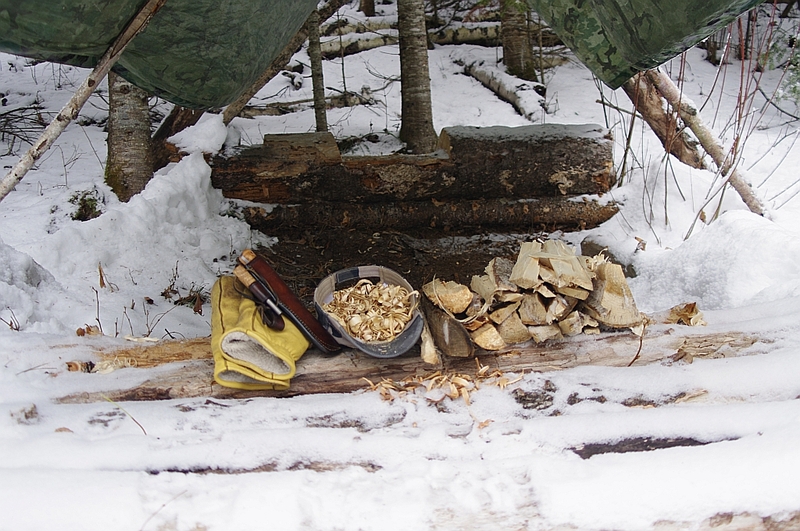 It didn't take long to get the shavings I wanted, nor to bust out enough dry wood to get a fire going. 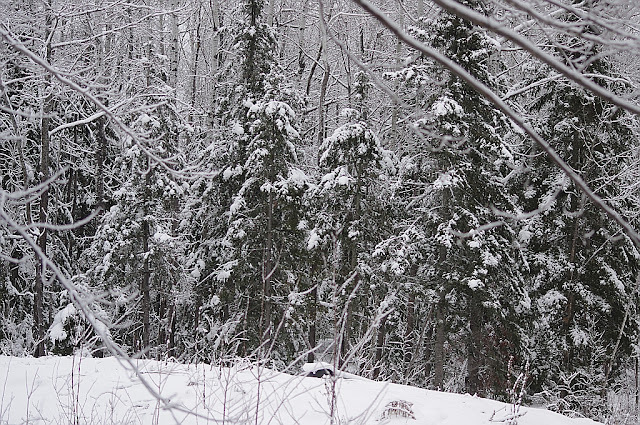 We've had a lot of wet snow lately, so wet and heavy even sustained winds hasn't brought it out of the trees yet. All our spruces and firs are sagging under the weight, all deciduous trees are encased in ice. Finding something dry was nigh unto impossible, I had to cut a few rounds with a Bahco saw in order to get what I needed. Once I had the fire prep done I cleared some of the snow from the fire pit and put together a wood raft out of some split offs in order to keep the prep out of the snow. 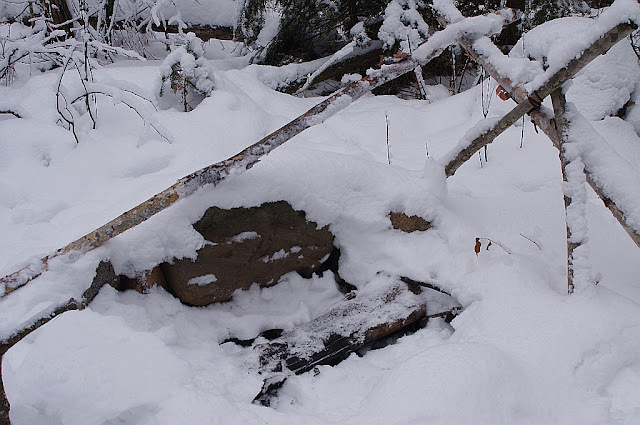 The pit was dug some time back and has a large flat stone as a reflector. A couple passes on the ferrorod and fire was had. While getting a spark from the spine wasn't hard, I believe I need to square the edges into a harder 90 in order to get the kind of sparks from the rod that I do with some of my other knives. Lisa and Wolf Creek Forge have produced another solid product, other than the jimping I'm not sure I'd change anything else about it. 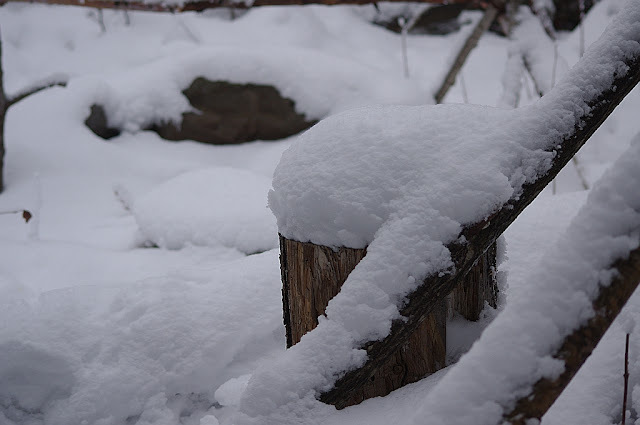 While I favor blades closer to 6" there wasn't anything I wasn't able to do with this 4". 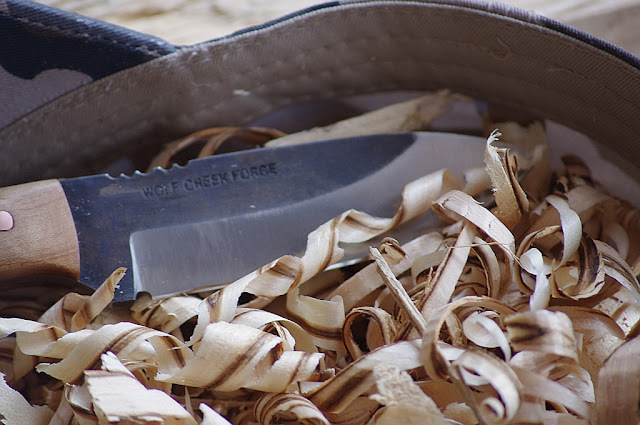 Fit, form, function, and good price point, so far nothing but good things from Wolf Creek Forge. That's a very handsome tool! 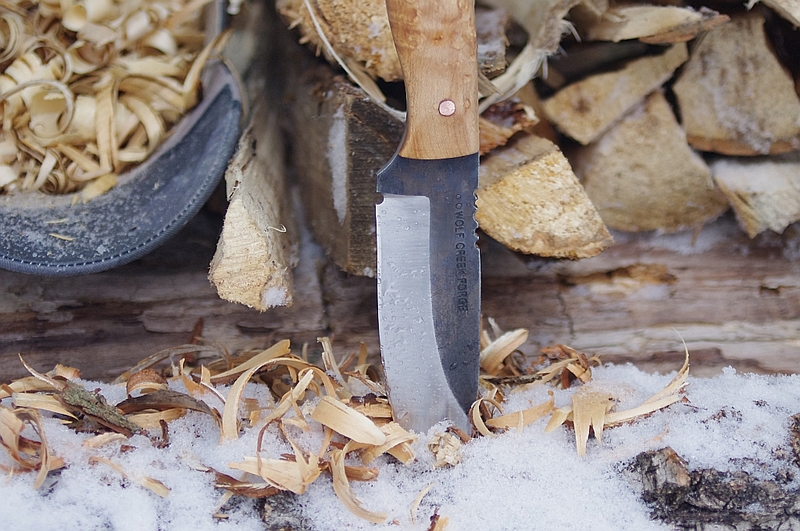 Despite the 4" blade, it looks like you might be able to do some light chopping with it if need be, thanks to the thickness and height of the blade. Thanks for the review. A review will come later, though unless something unexpected comes to light I don't imagine it'll be negative. The jimping has got to go though. Thanks for the words WW. 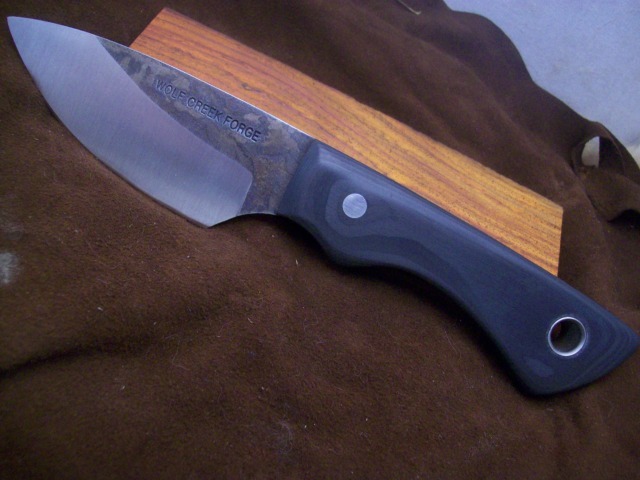 Great looking knife AG- I am looking forward to seeing it again after you modify it. Mr. Grouch, That is a sweet looking knife. I am looking forward to your review. In addition, I wanted to tell you how much I enjoy your blog, especially the camping and photography. I am planning on starting my own blog and your blog is an inspiration. By the way, are you in the Arrowhead?